5.2012 (dj) Mick Hale Returns!!! . 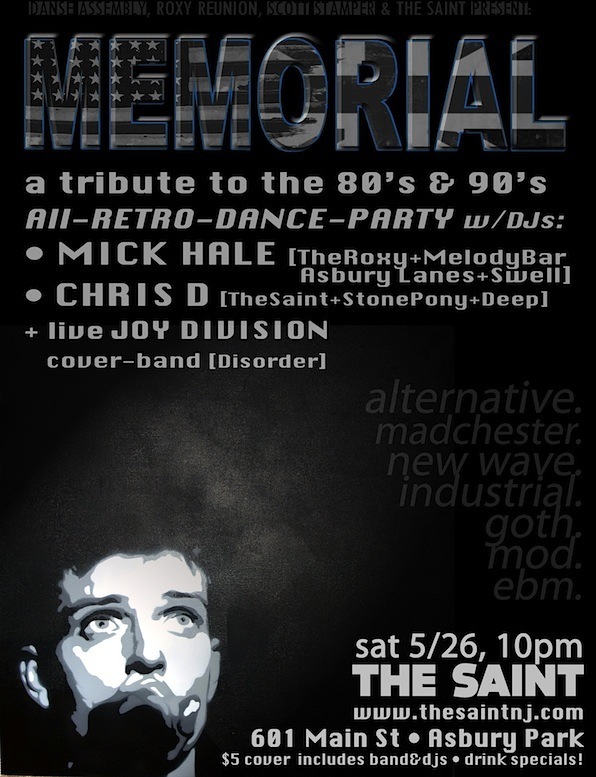 . .
MOD FUN's own Mick Hale will be DJ-ing an "Alternative, Madchester, New Wave, Mod, Goth & EBM" nite dedicated to the best 80's & 90's "Alternative" dance music -- similar to the sounds he played at The Roxy & Melody Bar in the 1990's -- for One Nite Only SAT MAY 26th, in Asbury Park at The Saint, also appearing is DJ Chris D. & "Disorder" a Joy Division tribute band. The Night is called "Memorial." Don't Miss This! 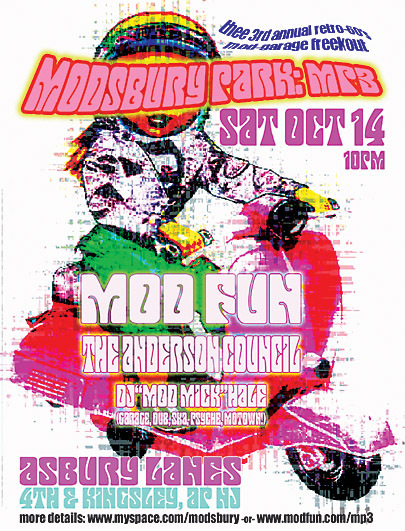 6.2010 Modsbury Park Returns!!! . . .
5.2010 Coming (even) Soon(er) . . . BREAKING NEWS! 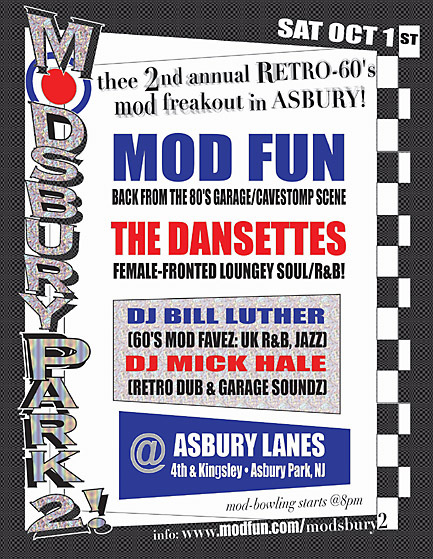 MOD FUN has been invited to appear LIVE on the mainstage at this year's "Asbury Pride" fesival. MF takes the stage at 1:30PM (SHARP!) 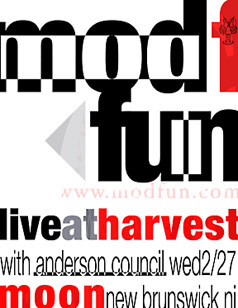 for the 1st time at this huge yearly (all ages!,) event in Asbury (5th Avenue @ Convention Hall, Noon-5pm.) Click for even more info. 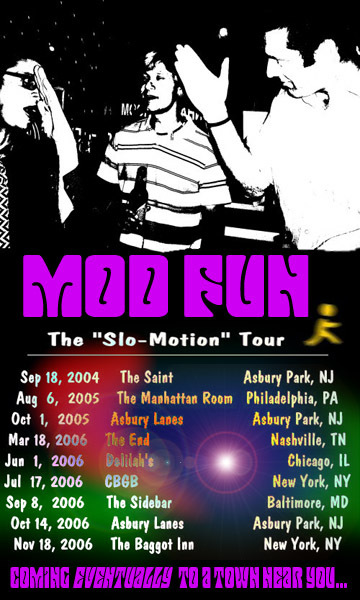 MOD FUN's next (club) show will be on Fri July 9th at the world famous Asbury Lanes (we're 70% done setting up support,) more details will be availabe shortly. In the meantime BOTH new(er) cds are now available at the bricks'N mortar shoppe in Fords, NJ "Vintage Vinyl" (as well as The Record Collector in Bordentown and Princeton Record Exchange. If you can't find them in the store, ask at the counter.) Pretty much any shop in the USA can get them thru CD BABY too; but then again, so can you... have sum MOD FUN! 3.2010 Now Available . . . Happy to announce that Futurepresent is now "live" on iTunes and Amazon (for downloads) and CD BABY for physical-cd orders!!! 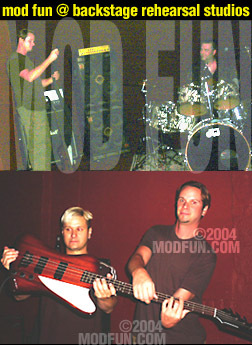 or order direct thru MODFUN.com by clicking the banner at the top (use PayPal & get free stickers & a Poster with the cd!) 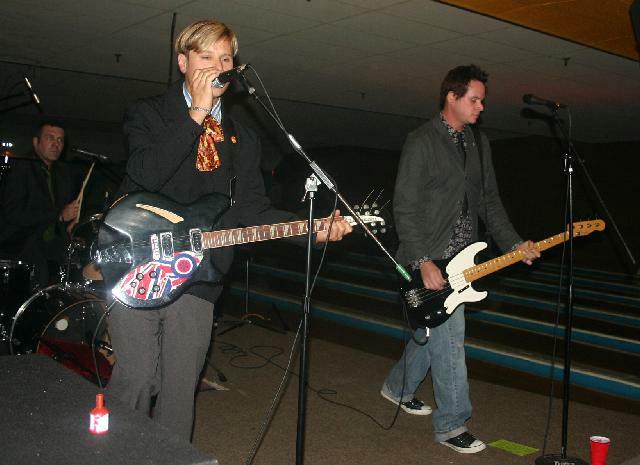 Also, go check out these new reviews for the cd: Kinston Free Press & JerseyBeat.com and remember to check out MOD FUN's own Mick Hale on his "interweb radio show" the WMU archive is ava 24/7 here! cheers! 2.2010 On and On . . .
Much thanx to everyone who made it to our "winter preview" shows for the new CD "Futurepresent" Check out our YouTube™Channel for some new "live" clips from the 2 shows! . . . we'll be back at it live soon; rite now we're setting up the CDBABY page for the release & gearing up for a full-on promo-push in Spring... In the meantime, check out the new "weekly archive" for MOD FUN's own "DJ" Mick's internet radioshow The Weekend MIX-Up! (You can still stream it Fri & Sat @ 9pm & Sun @ 1&6pm over at BlowUpRadio.com,) but it's now (also) available here (24/7) for streaming, or (right-click) downloading 4 your audio enjoyment here! 1.2010 Hippie Nu Year, Kids . . .
12.2009 IT'S SO ALIIIVVVEEE ! ! ! . . .
DID YOU MISS US? WELL, WE BEEN BUSY . 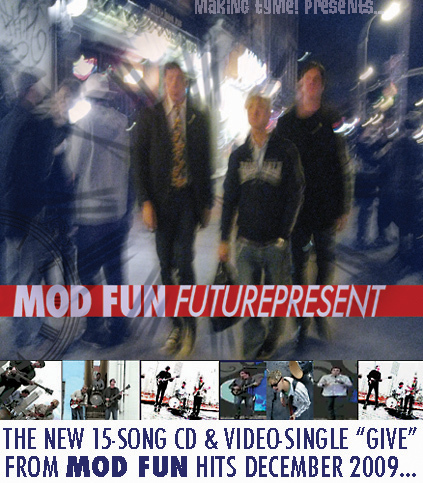 . .
We are delighted to announce that the new MOD FUN album "Futurepresent" will be out in December'09 - we are hoping to have it released before the 25th (makes a GREAT stocking stuffer, we might add!)... 15 tracks in all, with 11 written (& sung) by Mick; 3 (writ&sung) by Bob & one (writ&sung) by Chris! 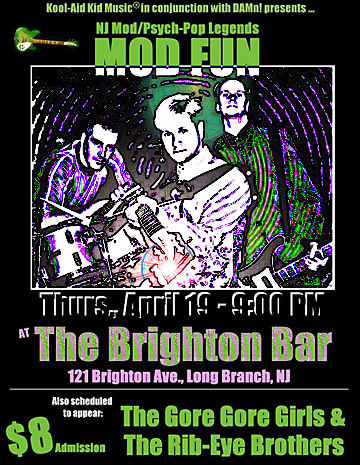 A first for a MOD FUN release, and After hearing the results dunno why we waited so long to "mix it up" on record like this... Needless to say it's a good 'un...Watch for the 1st single to be previewed (on MySpace) 12.3.9 . . . MOD FUN also just finished shooting footage in Asbury Park for said 1st single ("Give") - when that's done in production & posted to YouTube, we will get a link on here in the meantime check out the older videos on the all-new MOD FUN YouTube channel... also stay tuned for announcements for "In Store(s)" and Club-gigs in the early new year!!! AND AROUND BACK ONCE AGAIN, IT'S . . .
MOD FUN will return to the small, cozy BUDDIES TAVERN in Sayreville on SAT AUG 15th, also on the bill will be our long-time "buddie" Jim Testa of Jersey Beat Fanzine fame & kosmic daydream... it's part of "BlowUpRadio.com"s free concert series so - NO cover!!! Good beers & food in a small pub-setting... We will play a lotta nu tracks off our upcoming release which is currently in the "mix-down" phase...check it! SAME BAT-TIME, SAME BAT-CHANNEL . . . 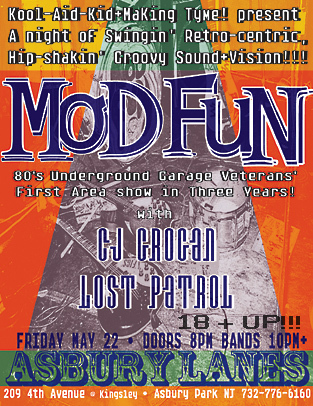 THE HOBOKEN MUSIC AWARDS have nominated MOD FUN in their "surrounding area Pop-Rock/Alt" category email: hobokenmusicawards@gmail.com to vote (enter "MOD FUN" in the subject line.) AND THEN come check out the Awards Ceremony (we will be playing a live set!) 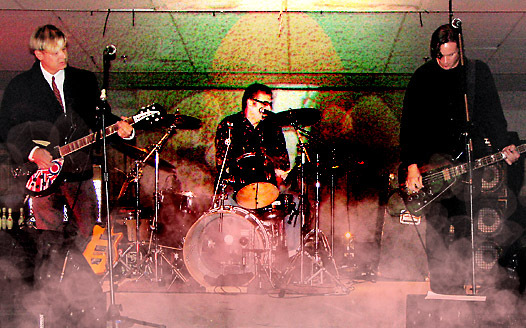 on SAT APRIL 25 @ TheGoldHawk more info at the HMA's "MySpace." MOD FUN hit the stage again (finally!) in February, with a batch of new material! Check out the flyers at the left for all the details (click for links.) 2 Maryland shows on 2 saturdays over 2 months seemed to us like a nice way to break back into the saddle, don't you think? Both shows are with the Names, (from MD) and both are at great venues, to boot - don't miss these! ...cheers! WOW! yes, it's been a while since an update - we basically took the summer off (as you can see, hehe!) a few dj spots kept "dj (mod) mick" busy, as did a solo acoustic gig for Chris, while Bob found time in between moving (and breaking bones;) to write some new material which will be included in a new set (and album) the band is working on now... there are a couple of gigs brewing for fall, as well as the recording sessions - in the meantime check out this MF video we unearthed this spring (from 1983!) for the "Real Rock TV" show - now transferred and live on YouTube! 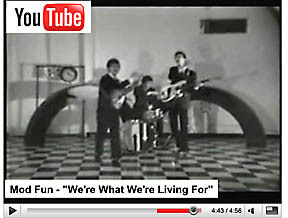 Click the Black & White You Tube image to the lower left to go "Way Back!" 04 & 05.2008 ALL OUR BUDDIE(S) !!! GREAT! is how to sum-up the NYC show at Crash - the open bar was amazing, the crowd young and hippiest, the dj cool, the other acts dope, all-around a buncha fun... thanks to all who came out for the gig... And Now, we'll be back at our "favourite little watering-hole in the wall" BUDDIES TAVERN in Sayerville on Sat May 10th for Lazlo's (Blowupradio.com) birthday bash with our ole', ole' buddie Jim Testa (JerseyBeat.com) opening the birthday-bash... doors at 8pm, we'll be onstage at 11 -- no cover!!! 03.2008 BACK,... IN THE NY GROOVE !!! 02.2008 IT'S A NEW NEW YEAR, BABY !!! 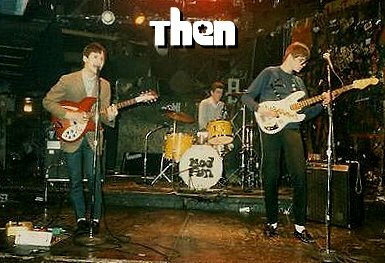 Wow - My how time flies, NYE came and went with a groovy Lobster Fun show in Bergen Co. and we're back in "original" mode now for the following gig -- hope you can make it -- it is MOD FUN's 1st show in New Brunswick since the 80's !!! 11.2007 SO MANY MONTHS LATER !!! Sorry for the lack of updates - we were busy at work with our "Lobster Fun" gig at a secret location which went amazingly well - so well in fact, that we will be back in that "MODe" for a show on NYE!!! 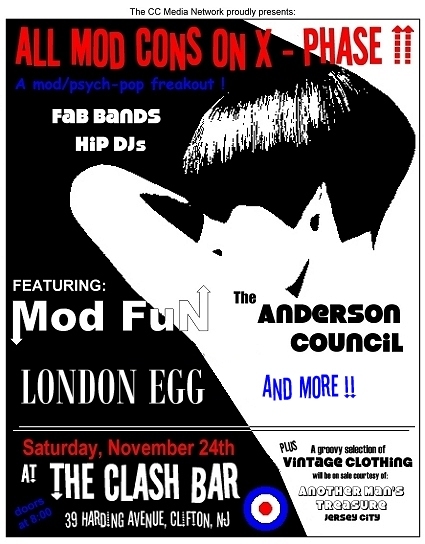 Next up for MOD FUN, however is the 2nd "All Mod Cons" retro-mod-garage-psyche night, this X at the CLASH BAR on Sat 11/24 -- click the flyer at the left for all the details ..
08.2007 MORE SUN-NY LOOPY-NESS !!! Next live gig coming at you from the LOOP LOUNGE in Passaic, NJ -- Friday Aug 24th 10pm -- great lineup, great bar, great club - don't miss it... "Now... And Again" cd's available at show, (cheep!) as usual!!! 07.2007 HOT SUMMER MODNESS !!! 06.2007 HERE IT IS... NOW !!! 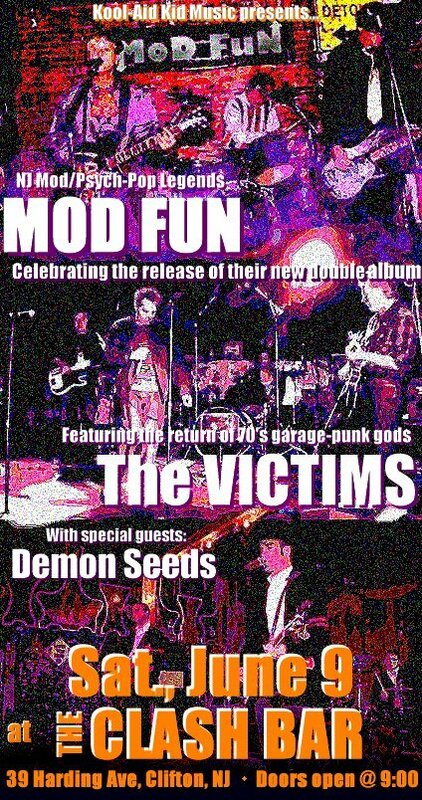 MOD FUN's first release of new material since 1987(! ), "Now... And Again" will be released THIS SAT 6/9/7, and we hope you can join us at THE CLASH BAR in Clifton NJ for our cd relese party on that date... we will be playing a bunch of tracks off the new cd as well as offering it for a "pre-sale" price -- doors are at 8pm and we hit the stage (early!) at 9pm sharp, so don't miss it... IF, however you must, (miss the show that is), don't miss out on the cd -- ordering info is available here (or click on the CD annime to the left of this blurb.) Cheers! 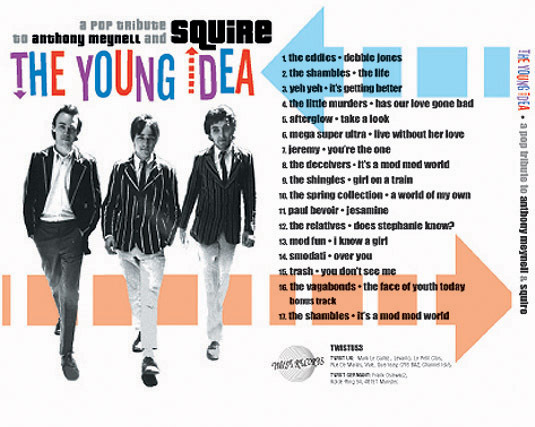 As you can see, the site has had an overhaul... check it out (new pix in the gallery, updated bio, more stuff coming soon)... ALSO the SQUIRE tribute cd is out now! 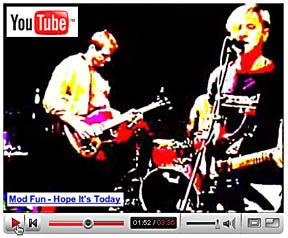 It features MOD FUN's 1st recording since reforming in 2004 ("I Know A Girl") Check it out here,... more soon! Lost In Tyme (Greece) fanzine #3 and comp is out now featuring an interview with MF and 2 tracks on the cd... Click Here for more info . . 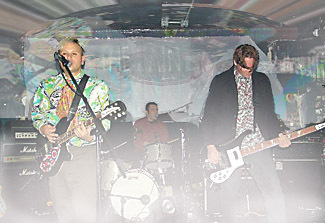 The IPO NY show we did in Nov. of '07 was good, and we'll be back at the live thing in Spring if all goes well... Recording now for a new full-length release (also) in Spring ... more news soon, have a good one! 1 Live show in NYC for November and Started New Recordings in OG @ "DAMn!" . . .
Baltimore... Here we come -- we're going to MD for the 1st gig there since we played in the 80's with Lord John at the "Congress Hotel." 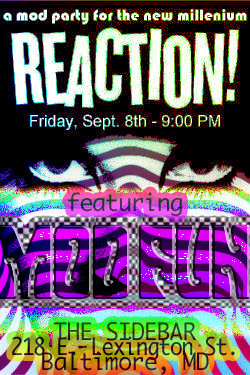 This time we're off to the Reaction monthly Retro-Night and we share the bill with a few mod-ified DJs, and the sights and sounds of "Sidebar Tavern" Friday Sept 8th is the date, and 4 more info click: here! 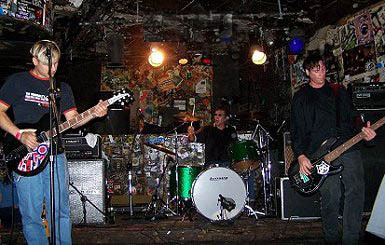 Busy as a bee we are,.... MF did a liveset on WPRB Wed (which is archived there for streaming), & we're off to thee "big apple" on Fri for what is billed as the "last ever mod-garage-psyche-out" at CBGB (they are closing the Bleeker & Bowery location in Sept, because of a non-renewal on their lease) 7 great retro/60's influenced acts starting up at 8pm, and we're on at 11:30 + it's 16+up -- so just GO!,... 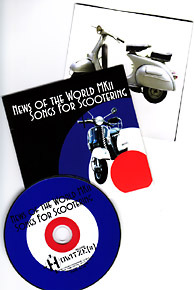 CD:News, now released is the compilation "News Of the World mkII: Songs for Scootering" (which we contributed the track "Leaving Here" to.) More updates will go into more detail on this and the following: MF live in Baltimore (@ Reaction) in September, and (drum roll please:). . . MODSBURY PARK: MP3! coming in October . . . stay tuned! 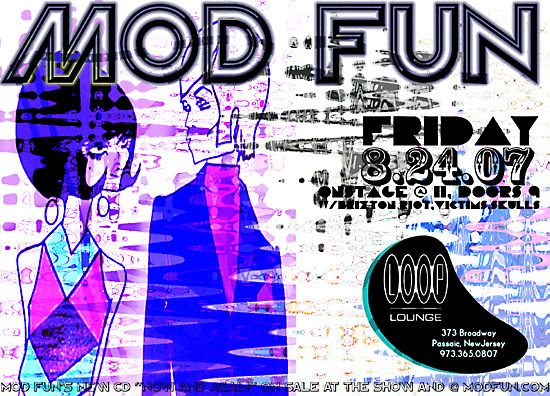 WHAT a freaking amazing tyme @ Mod Chicago, xtra special thanx (a BIG "TA!") goes out to Eric for having us there, and all the new mates and everyone who made it out to the opening night "gig" - we had an absolute blast and are already looking FWD to MC6! 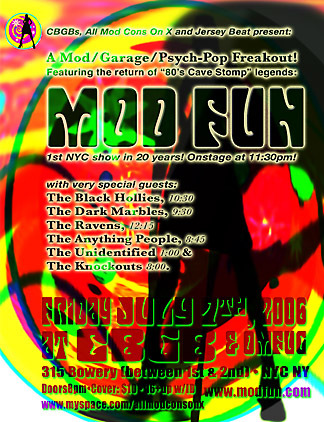 UP NEXT: we headline the last-ever "Mod Garage Psycheout" on 7/7/6 at the legendary original CBGB's location on the Bowery (at Bleeker)... this is our 1st NYC show in about 20 years, and CB's will close it's current doors at the end of summer, so DO NOT miss this one! 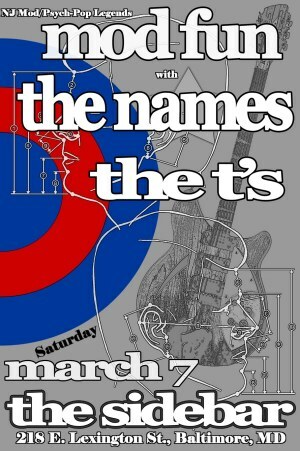 7 retro/60's acts on the bill. . . doors at 8pm!!! 5.2006 BUT WAIT,.... THERE'S MORE! We're back from TN y'all... twas a (mod) fun trip, & we will post some pix shortly . 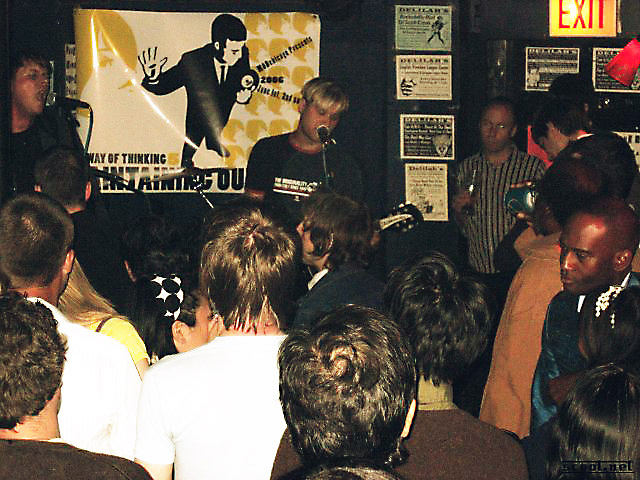 . . first - we wanna announce our live appearance at "Our Way Of thinking" the MOD CHICAGO weekender on June 1st -- more info to follow soon. . . Happy Nu Year to alla y'all... 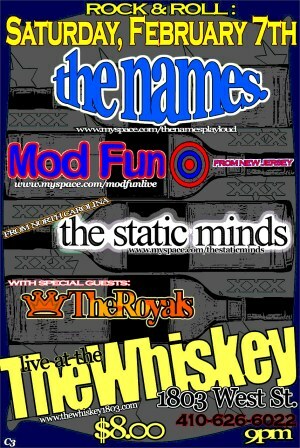 Guess where the next MOD FUN show will be.... Nashville! That's right, we hit the road to play the internationalpopoverthrow on March 16 (St. Patty's Day EVE.) We are also working on some other out-of-town spots for the near future. The new recordings are moving along also,with a new version of "99th Floor" on our "My Space" page now, look for it now! Happy Holi-Daze to ya!!! 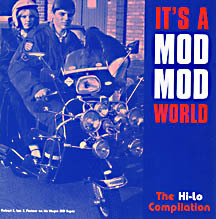 We just unearthed a copy of the "It's A Mod Mod World" comp on the Antenna label (UK). It features the original mix of "Open Your Eyes" from the Hi-Lo comp "American Heart and Soul" from years back. Inside this ace comp is this kewl little blurb about MF in thee booklet -- click here to see! 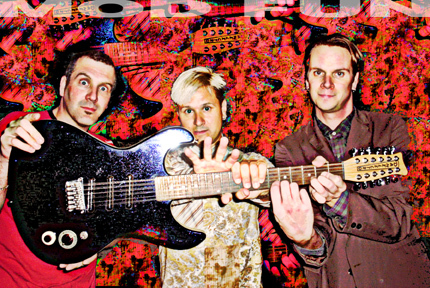 Also - we got some promo pix back we took in Philly with Beth... click the pic below to see it bigger. . . 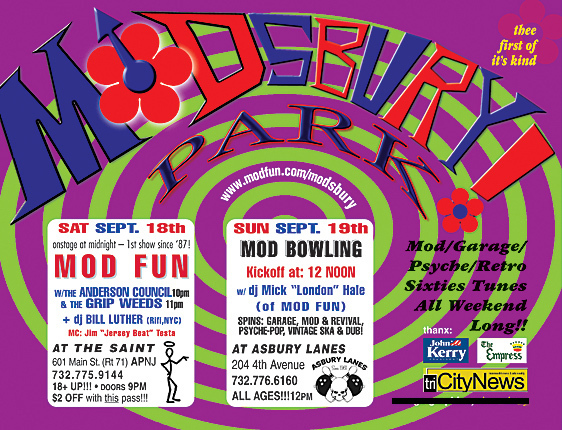 The text from the Asbury Park Press article(s) on "Modsbury Park" are on-line here, and also a website with old images from the "Dive Daze" is being run by the Cheepskates' Dave here, look at the images link! Ta! To everyone who made it out to MODSBURY PARK 2, we had a blast and hope you all did too! Looking forward to next years (already!) Here is a link to Bill's photos from the evening. 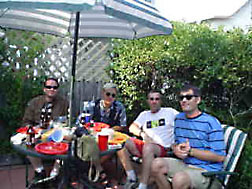 And a'nutter one to Jim Testa's Jersey Beat blog (with a recap & yet a'nutter link to the pictures he took - see above!) Click HERE to see the TriCityNews, (Monmouth County's Arts paper) coverage! We will post more images from this amazing night in the very near future. Again, thanks for such a smashing turnout and great night! 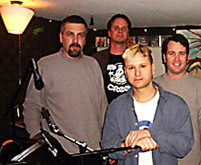 9.2005 New Feature on "Lost Bands"
Click here to read the chat with Mick on the Uppers Modsite! The MODSBURY PARK #2 event had to be moved (by the venue!) -- we HAVE now confirmed OCT 1st (2 Saturdays later) - more info here!!! 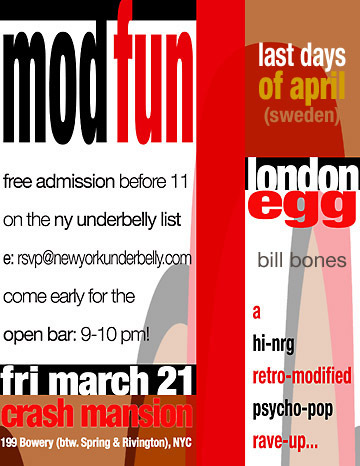 MOD FUN is happy to announce that the Dansettes (excellent female-fronted r&b/soul from NYC) will be joining the boys and dj Bill Luther for "MODSBURY PARK" 2! in September at The ASBURY LANES on Saturday the 17th (just about a year after thee 1st MODSBURY,) more details will follow, also MOD FUN have 3 new original tracks in pre-production along with a slew ov cover-versions for a new release in the "planning" stages now... See you at the Philly Freakout on Sat Aug 6!!!! >> "My old buddy Jim DeRogatis and his wife Carmel came into town for the weekend....then on Saturday, we all went down to Asbury Park for the Mod Fun reunion. 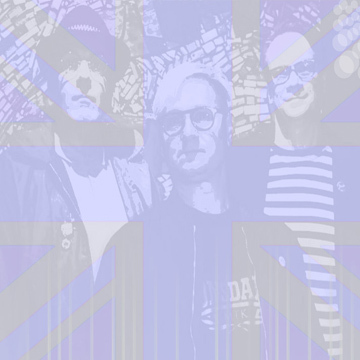 Mod Fun are currently recording some of the recent live set along with a few covers for upcoming "tribute" cds - the 1st is "I Know A Girl," by the 80's Mod band Squire, which is due out early '05 on Twist Records. Next up is a cover for another 80's Mod icon: Manual Scan - who's Bart personally suggested "Nothing Can Be Everything," which seemed appropriate, as the M.S. 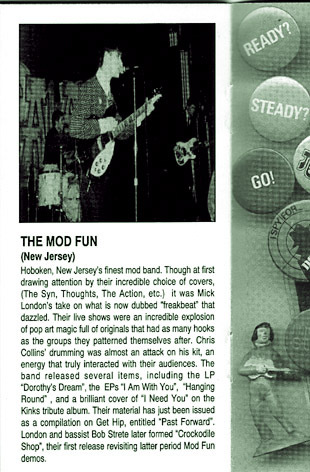 best-of liner notes credit the phrase to Mod Fun's own Mick, from as it puts it "a drunken sojourn into Tijuana, Mexico!" Hehe - we'll have some tequila for that one Bart! Another title is by the Beatles "She Said" for a Revolver-only tribute. We will try to post MP3 samples ov this stuff in a few weeks when done. 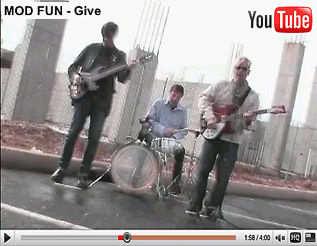 In the meantime check us out (w/ 3 free MP3 tracks) at Mod Fun's "my space." and if you have a page there - add us! The Modsbury Mod Fun reunion pix will (still) be posted soon! Sorry for the delay! In the meantime, please visit the following link to see what the actual US Military both in and just back from Iraq are saying about it... and Bush is cutting staffing and funding to the VA! Operation TRUTH : Please support the military & VA ! Pic courtesy East Coast Mod Archive (Yahoo). Pics are property of modfun.com - please no editing or other usage. On Sat. 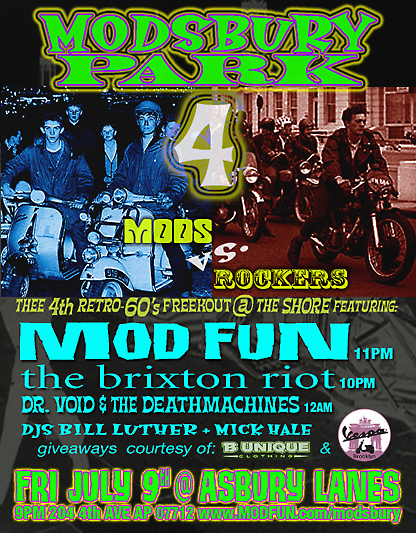 May 1st Mick & Chris (along with Chris' wife Lyn) attended the gear fab guest dj set from Bill Luther at SMASHED BLOCKED in NYC (a once a month self described 60's Mod/Freakbeat event at RiFi on 11th Street bet. 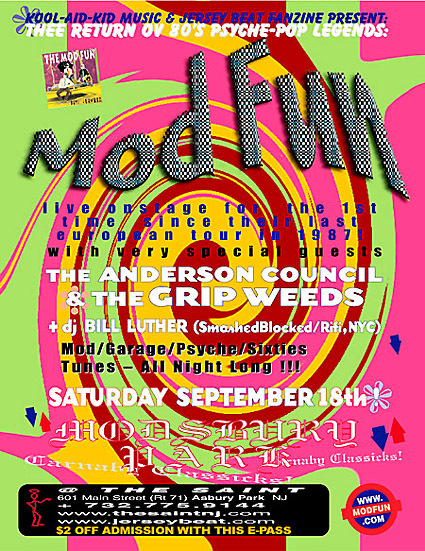 1st & 2nd Ave)... also holding court were Mike & Rob from The Insomniacs, the NJ/NY current mod act... and Martin from the Bike Club,... could a full-fledged NJ/NY Mod Revival be imminent?... Stay tuned to this web-site to find out!!! hehe!!! Pic taken by Bill Luther and courtesy E.C. Mod Archive on Yahoo! 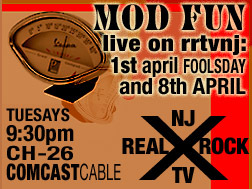 On April 2nd the 2nd "jamming session" for Mod Fun in about as many months took place. Just days befour, Get Hip Records re-issued the "Past Forward" Best Of CD.